April 15, 2012 April 18, 2012 Steve Miller2 Comments on Light That Thing Up!!! Rich Waltz hysterically announced Omar Infante’s solo home run in the second inning, as the first ever Marlins tater left the new park and landed in the Clevelander. Infante left the yard as if on cue from Craig Minervini, who was simultaneously conducting and interview in the left-field club section. The ball landed just a few feet from where Minervini, the Marlins on-field reporter, was standing. 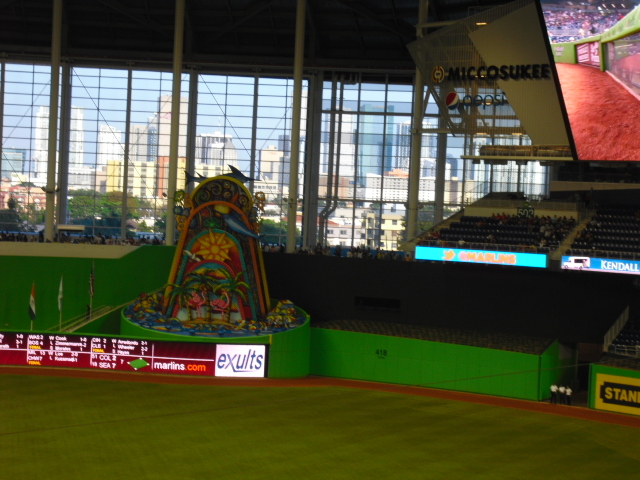 For those who do not know, whenever a Marlins player hits a home run, the sculpture in centerfield will light up, spray water, and the birds and fish attached to it will dance around. All eyes turned toward the gizmo as soon as Infante’s homer hit off the façade on top of the Clevelander. The original plan for my excursion to Marlins Park was to get left field seats for the opener against St. Louis, but since I knew tickets for that game would sell quickly, I was all for heading to the Astros series, but that didn’t pan out either. I was planning on going for left field seats because I wanted to catch the first home run at the park. I settled for tickets to the Yankees exhibition series when the opportunity arose, despite the fact that I would not be catching a home run. It doesn’t matter much, though, because the left field seats will not be getting a whole lot of home run action this year. That is partly because the fence is so deep, but also because the seats are raised above both the Clevelander and the home bullpen. Infante’s home run actually hit the Clevelander sign, near the staircase. Even if I had secured a seat on that staircase for that game, the ball was too low to be caught. But a fan standing right behind the fence in the Clevelander happily caught the bounce off the sign. He was interviewed by Minervini moments later. Even though I could not possibly have caught the ball, I would have liked to have been there to see the sculpture go off. Hanley Ramirez set it off for a second time in today’s game, with an 8th inning bomb to straight-away center. Ramirez’s blast tied the game at 4, and he secured the walk-off RBI in the 11th to cap a 4-5, 3 RBI day in Miami’s 5-4 win over Houston. According to ESPN, Hanley’s game-tying blast traveled 443 feet. The Marlins capped a series win over Houston on Sunday afternoon, as they sported their orange “Marlins” jerseys for the first time this season. Miami is off tomorrow, and on Tuesday Ozzie Guillen returns from suspension for the home game against the Chicago Cubs. I’m a bit confused as to which games you attended, by how you wrote it. Also, will you be writing about the one you *did* attend? Sorry about that. I just alluded to my trip in this post, but I attended the April 2nd exhibition game against the Yankees. 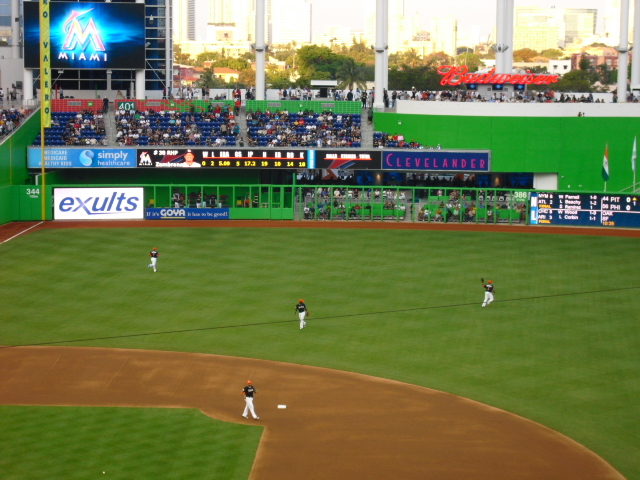 I wrote about it in the posts, “Marlins Park Features,” and “Marlins Park Logistics.” I am eventually going to write a long post about my trip, but I haven’t gotten around to it yet because of my baseball season and such.